In which I take a look at the opinion polls, and what that'd mean for parliament. If you would like to post this to your website, see the previous post for the code. <a href="http://www.makemyvotecount.org.uk/opus26009.html"><img class="thing" src="http://www.makevotescount.org.uk/i/thing-3.png" alt="3. Write to your MP. Ask them to forward your comments to the Minister" title="3. Write to your MP. Ask them to forward your comments to the Minister" /></a> <a href="http://www.makemyvotecount.org.uk/opus26011.html"><img class="thing" src="http://www.makevotescount.org.uk/i/thing-4.png" alt="4. Contact your nearest PR Politican. Enlist the support of your MEPs/AMs/MSPs" title="4. Thank your nearest PR Politican. Enlist the support of your MEPs/AMs/MSPs" /></a> <a href="http://www.makemyvotecount.org.uk/opus25967.html"><img class="thing" src="http://www.makevotescount.org.uk/i/thing-5.png" alt="5. Have your say: Governance of Britain. Tell the Ministry of Justice that voting systems matter" title="5. Have your say: Governance of Britain. Tell the Ministry of Justice that voting systems matter" /></a> <a href="http://www.makemyvotecount.org.uk/donate.html"><img class="thing-last" src="http://www.makevotescount.org.uk/i/thing-6.png" alt="6. Donate to the Campaign. Help us maximise what we can achieve" title="6. Donate to the Campaign. Help us maximise what we can achieve" /></a> If you would like to post this to your website, see <a href="http://www.murky.org/make-votes-count-code/">murky.org</a> for the code. I do not know how to hack into systems, but some people do. If the Pentagon can be hacked into, the Blaby district council website on conducting elections can be. It is as simple as that. No one in the House has any idea what it could lead to if we go down the route of e-voting. My Lords, when will the Government honour their manifesto promise to put to the people in a referendum the issue of elections to the House Commons? Does the Prime Minister designate regard this issue as a vital ingredient in his campaign to reconnect citizens with their Parliament? I am grateful to the Minister for indicating that the report will take into account recent elections, but will she take this opportunity to reiterate and emphasise that the 141,891 spoilt ballot papers in Scotland were on the first-past-the-post and top-up ballot paper and not on the proportional representation STV ballot paper for local councils? I've just been to vote in the local elections. We have three major parties in the UK, plus some others - and I had a choice of two parties (each fielding several candidates, it was a 'pick four' for one ballot and 'pick two' for the other). What annoyed me was that at the door of the building there were two campaigners, who, in quite a forthright way, asked for my voter registration number. This presumably allows them to hassle people later on. It was actually quite offputting, and if I was a floating voter could have made me swing the other way - the last thing I wanted was politicos at the last minute. Apparently the rules have just changed so they can do this on the way in (it used to be just on the way out). In my opinion, no campaigner should be allowed to be within 100yds of the building if they've anything visible which identifies them as such, or if they behave in a way that makes their affiliations clear. It just wasn't too comfortable. Much more interesting than "When will Blair go?" is "How has he survived so long?" And the answer is that Blair has not only carried out a kind of imposture, he has hugely benefited from grave systemic faults and deformations in our political culture, and in the process crushed both cabinet and parliament. ... our electoral system distorts the result in favour of the winning party, in 1997 giving Blair 63% of parliamentary seats with only 44% of the popular vote. He has now empirically made the case for reform as no other prime minister ever has. It is quite impossible to defend an election in which a party wins 55% of seats with just over 35% of the vote. By no accident, it is now very difficult for a Labour party leader to be removed by the party itself, harder than it was for the Tories to remove Thatcher or Duncan Smith. But there is nothing to stop MPs from voting in the clean, clear light of the Commons against a government which no longer enjoys their support. It really ought to be easier to get rid of an unwanted prime minister than an inadequate football manager. Politicians are already seen as remote and arrogant. How much worse would that problem be if they were able to compel money from their constituents by law, instead of having to ask politely? ...state funding allows existing parties to form a cartel against newcomers. Or, to put it another way, it shields them from the consequences of their unpopularity, because there is nowhere else to go. ...perhaps the best rebuttal of the case is the obvious one: what bloody cheek. Caught breaking their own rules, the political parties demand that the rest of the country should pay them with sufficient generosity to remove them from further temptation. Again, Bravo! I say! Bravo! There is certainly something very odd about arguing the case for state funding on the grounds that without it you might be tempted to bend the rules. It's a bit like a burgular knocking on your door and telling you that you've an obligation to give him your valuables in order to save him from the moral nightmare of committing a crime. Personally I hope that state funding doesn't become a reality, and it does worry me that the Conservative leadership has been making noises to suggest it might support the move. Taxing us for the privilege of choosing who taxes us would be absurdity verging on idiocy. The major political parties have got themselves badly in debt, can't manage their finances, and, in their self-made predicament, have committed various sins and crimes. So now what do they do? Tighten their belts, spend less, behave honestly, apologize? Not a bit of it ... they work together to claim that tax-payer funding for political parties would make everything better. Aaargh! How about: Parties can only spend money that they've declared as having raised, from declared sources. Any member contribution of over, say, £50(?) per year must be openly recorded (and perhaps such donation could be tax-deductible, would beat state funding), no loans except on an openly reported commercial basis. Parties that can't raise the money from a broad base of member support aren't, by nature, broad based political parties. ... I am committed to open, transparent and broad-based funding of the party. Just as it is wrong for Labour to be in hock to an improbable alliance of trade unions and millionaires and it is wrong for Conservatives to be in hock to multi-millionaires. We Liberal Democrats must show the way by developing a broader base of donations to fund our campaigning. We can expect, therefore, at least the Lib Dems to oppose moves toward state funding., to do otherwise is to turn against developing a broader base of donations. State funding of political parties is wrong because it is fundamentally immoral to force citizens to pay for organisations whose goals and objectives they do not believe in. Would it have been good to force people on the left to pay for Labour and National in 1990, when both parties were pushing economic liberalism? Is it right that the last election result should decide funding to campaign for the next one? Labour is broke, that is why all their lickspittles are banging on in the blogosphere about "democracy funding". This of course is typical tactics for them. Obfuscate and muddy to draw attention away from the blindly obvios fact that Labour are broke, they have next to no members and have to rob and pillage not only the public purse but also the purse of hard working Kiwis through their unions. "My basic contention is simple: people vote in order to affect the output of government in ways that are meaningful to them. Low turnout thus reflects a paucity of choices or a lack of evident connection between electoral choice and policy change. Raising turnout by making it compulsory does not directly affect either of these critical variables but may mask their effects." â€”Mark N. Franklin, "Electoral Engineering and Cross-National Turnout Differences: What Role for Compulsory Voting?" For me, compulsory voting has no place in the UK, partially for the reason above, but also as the administration would be expensive, and the result would be a turnout of people who couldn't be bothered otherwise. Compulsory voting would increase the turnout of the ill-informed, hardly a good basis for a decision. Add a 'None of the above' or 'Reopen nominations' to the ballot in order to allow a distinction to be made between apathy and disillusionment. Make votes count, replace the 'First Past the Post' system which ensures that a Labour vote in Surrey, or a Conservative vote in Scotland is unlikely to bear fruit. Replace it with a 'Single Transferable Vote' system, which still has the constituency link, still allows people to vote for individuals (not lists), and avoids the problems involved with 'splitting the vote' when several stand against an unpopular candidate, who then wins because the opposition vote was split. E.g. With Neil Hamilton in 1997, the Lib-Dem and Labour candidates stood down to give Martin Bell a clear field. Though Hamilton was not re-elected it did remove choice from the electorate, and would have been unneccesary under STV. Moving toward 'STV' would allow several candidates for a particular party to stand in the same seat, allowing the electorate a true choice. I imagine that this would be rare for financial reasons, but would occur when there is a real split in the local party - thus providing a real electoral choice. I noticed that David Cameron, on Today this morning, was talking about boundary reform. He was saying that it was important that the boundaries are to be redrawn to make constituency sizes more equal. He was saying that the importance of a vote should not depend upon where a person lives. This had me shouting at my radio that he was missing the point by a country mile. (Or words to that effect... I was in the privacy of my own car). Unfortunately, under first past the post redrawing boundaries does not a fair electoral system make. If you live in a safe seat, your vote has less impact that the guy down the road in the marginal seat (this is my situation). If you are a labour voter in Surrey or a tory voter in Scotland, you are unlikely to get any representation (a significant number of Scots voted Tory in 2005, but got no representation at Westminster). Single Transferable Vote is my preferred option, it maintains the idea of a constituency link (one votes for the person, not the party). How this works is that the voters rank their choices 1, 2, 3 etc... if there is no clear winner (50%+) then the person with the least votes is eliminated and the second choice votes are redistributed. This process is repeated until we have a clear winner. This may be a little slower, but surely that's a fair price for better? With STV we have a final electee who most are happy with, and people can express true preferences. It would virtually eliminate the tactical element of 'I want A, but B might get in, so I'll vote C to keep them out'. It would avoid splitting the vote, suppose we have an unpopular candidate, let's call him Michael Port. Under First Past the Post (our current system), the vast majority might want 'anyone but him', and with lots of opponents the opposition is split meaning Michael survives. The 'fix' with FPTP is for all but one candidate to withdraw. How much better would it be for all of the opponents to stand and for people to express preferences between them? STV is not proportional representation, not that PR is neccessarily a bad thing, but it does make for a system where my vote counts much more than it does now. There are other voting systems, each with it's own strengths and weakness (list based PR is not good, in my opinion). 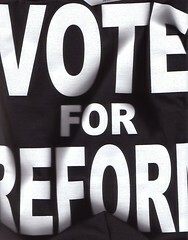 In 1997, Labour promised a reform of the electoral system in westminster. Where is it? Again, this was promised in 2005: "Labour remains committed to reviewing the experience of the new electoral systems â€“ introduced for the devolved administrations, the European Parliament and the London Assembly. A referendum remains the right way to agree any change for Westminster." I really don't understand why David Cameron, recognising the electoral bias that exists toward Labour* thinks it's simply a matter of equalising constituencies. It isn't, it's deeper than that. * (in England, labour lost the popular vote, but got more seats). Electoral Reform Fob Off replies, which are strikingly similar to things I've received. I've received a reply, as promised from the department of constitutional affairs with regard to my letter on electoral reform and the English Parliament. My MPs reply to a previous letter is here There are so many points to take issue with here, it's difficult to know where to start. Not least of which is the complete sidestepping of the issue - and who to reply to? The person writing the letter is probably just a lowly civil servant. Thank you for your letter to the Prime Minister dated 6th May 2005, regarding the voting system employed to return Members of Parliament to the House of Commons. Your letter has been forwarded to the Department for Constitutional Affairs for response, as the lead department for electoral issues. I can confirm that an internal review is currently underway within the Department for Constitutional Affairs, which will review the new electoral systems introduced for the devolved administrations, the European Parliament and the London Assembly this review is at an early stage, and decisions regarding any next steps for the review will be taken in due course. The government still maintains that a referendum remains the right way to agree any change for Westminster. With regard to the second point you raised; the UK Parliament is responsible for matters that affect the entire UK, including England. A fundamental principle of the UK Parliament is that all MPs have equal rights, and can therefore vote on any matter brought before them, whether they represent constituencies in Scotland, Wales, Northern Ireland or England. The vast majority of MPs are against removing this equality, with House of Commons rejecting a motion in January 2004, which sought to prevent Scottish MPs from voting on matters that did not ostensibly affect Scotland, by 377 votes to 142. Thank you for writing to the Prime Minister and I hope this satisfies your enquiry. Thank you for your letter of 27th May. You make a series of interesting points. Funnily enough just after replying to your previous letter I read a piece by Matthew Parris in The Times which encapsulated, even better than Jack Straw's article, my main feelings on changing the electoral system. I appreciate that the Single Transferable Vote and AV+ are among the more attractive PR systems available, but I still believe that first past the post is the best means of securing effective Government. I do, however, believe there may be a case for a form of Proportional Representation in Assemblies which are more deliberative and I am open-minded on the case for PR in a future reformed second Chamber. You am quite right to bring me up short for my failure to answer your question on England. I think there is a problem for English voters now that Scotland has a Parliament and Wales has an Assembly. I suspect the answer may be something close to the proposal outlined by William Hague when he argued that laws which apply only to England need to have the support of a majority of English MPs. But these are difficult matters to navigate and I do not have a definitive view on precisely the right means of addressing the problem you correctly identified. I know you will still find this answer unsatisfactory but thank you, nevertheless, for taking such an informed interest in this important question. I have several points I will be making in response (not least of which being my amusement that he doesn't view the commons as deliberative, but admiration at his honesty). If you have spotted things which need comment, please use the comment form for this article. It may duplicate my list, but there is no harm in that! Today I arrived home to find a T-Shirt waiting for me. It had been sent by 'The Independent' newspaper and is related to their Campaign for Electoral Reform. Monica commutes to London, and often goes in the vicinity of parliament. I hope she'll get more use from it than I! You should support: Single Transferable Vote (STV). STV requires larger constituencies than is currently the case, each electing between 3 and 5 MPs - with parties able to field more than one candidate in a constituency. Voters rank the candidates in order of preference with candidates being elected through a combination of first preference and weighted second/third/fourth etc preference votes. The system delivers a more proportional result, but is complex and still biases against smaller parties and is more likely to deliver multi-party coalition governments. So, when he responds fully to my letter I will be expecting him to support the concept of an English Parliament to match Scotland. The key question about anyone who exercises power - and it's Tony Blair's question - is how can I get rid of you and we can't rid of many of the people who make these decisions. Interesting. Given that in Mr. Gove's own conservative seat he has a majority whereby almost half of his vote could stay at home and he would still have been elected; How exactly could my ballot have been cast to increase the likelihood of Tony Blair NOT being Prime Minister? After all, once the job job of electing a non-labour MP was done, additional votes are 'wasted'. (The same argument could have been applied pre-1997 trying to oust the Conservatives). Applying this principle should logically make him support electoral reform! After all, where I live now, my vote can have little influence in voting out the government, if I were to move into a marginal constituency then my vote could be vital. Let's see what he has to say about my second letter. I wrote to Michael Gove MP on the issue of electoral reform, and this is what he had to say in response. I would like to think that I am open minded about all proposals to make our electoral system work better. But I have to say that the direct accountability of our current system seems to me to have many advantages. Even though he is not, of course, a Conservative the arguments made by Jack Straw the Foreign Secretary in The Guardian recently seem to me to make a persuasive case for the maintenance of the current system. Thank you for your reply to my letter of the 6th May. I am pleased to hear that you're open minded about proposals to make the electoral system better, and am glad that you are supportive of a system which allows direct accountability. May I venture to suggest that the current system actually inhibits accountability at a national level given that a voter in a marginal seat has much more power than a voter who lives in a safe seat? If you are referring to Jack Straw's article of the 12th May (available on the Guardian website), it seems that Jack Straw was writing against the use of list-based PR at Westminster. Quite right too, as it would be biased against independents. As I mentioned in my original letter, AV+ (as proposed by Lord Jenkins) maintains a constituency link, and hence maintains accountability. Still better than AV+ is the Single Transferable Vote which has no "list based" element at all. This would allow voters to say "I'd prefer A, wouldn't mind B, but would prefer them both to C". This preference is at the level of individuals and not parties. In a stroke this eliminates the need for tactical voting, as people can express their true preference without a need to worry about "splitting the opposition vote". Under a current system it would be possible for an MP who has the support of only 30% of the population to have three "protest" candidates gain 70% between then and still be elected. Under STV, the voters would be able to express preferences between the "protest" candidates without harming the chances of their protest being unheard. STV would not provide "proportionality" in terms of first choice, but it would give a government which most people can feel engaged with â€“ it would provide a much "better fit" than the existing system. STV is used for the Australian Senate, the Republic of Ireland, and several other governments. This is electoral reform where strong governments can be formed and where those governments do represent the true preferences of the people. I would be interested to learn your views on STV, and hope that you will give the issue of electoral reform further consideration â€“ list based PR is not the only alternative to first past the post. I still await your views upon the second question I raised in my original letter. The government has formed a sub-committee to look at these issues. The list of names does little to inspire confidence in this humble voter. I hope I'm wrong in my scepticism. Edit: Above letter modified slightly. Lord Lipsey, bless his little ermine socks, has made a cracker of a speech in the House of Lords, opening the debate on electoral reform. Once again, the Lords acts in the interest of the public and the elected government ignores it.